Q.: Why has the Aquarium been closed down? A.: For almost a decade, Detroit Zoo Director Ron Kagan espoused that the Aquarium was old, worn out and loosing attendance. Based on Dr. Kagan's advice, Mayor Kwame Kilpatrick, dealing with an enormous budget crunch was swayed by this argument to eliminate the Aquarium's annual $500,000 budget. Dr. Kagan's motivation for closing the Aquarium might have been his expressed desire to build a new 'Super-Aquarium' on the Detroit Riverfront. In order to achieve this aim, the historic Aquarium may have perceived as a hindrance and its closure would create the need for a new one. The complete lack of publicity for the Aquarium during Kagan's tenure may give some sense of his intentions. It is worth noting that while the Aquarium has been shuttered, the Zoo has spent millions of dollars building a nature center on Belle Isle, (Only open on weekends) so in reality it is not a matter of resource scarcity, but resource distribution. In 2006, the Zoological Society took over the Royal Oak Zoo. Due to budget difficulties, the Super-Aquarium plan has been dropped, and the State of Michigan has no Aquarium. Q.: What's the big deal? Why does it matter if the Aquarium is Shuttered? A.: It is Michigan's oldest and Michigan's only public Aquarium. Now that it is shuttered, you will have to take your children or grandchildren to a pet store to teach them about the aquatic world. That is a poor performance for a state almost completely surrounded by the greatest lakes in the World. Secondly, it is a historical treasure. It is the oldest continually functioning aquarium in the United States. Thirdly, the building, which was constructed by Albert Kahn is a national treasure. There are few buildings as old as this one that still fulfills its original intent. Finally, it was, and will again be a scientific beacon. In 2000, the Aquarium staff were given the prestigious "Bean Award", the most coveted prize in the aquatic sciences. The Aquarium is home to many species of fish that are fully extinct in the wild. Q.: Now that the Aquarium is shuttered how can I help to get it open again? them the aquarium is too important to lose. DONATE to Friend of Belle Isle Aquarium - let everyone know how important this is to you. We need money to meet our goals. ATTEND FOBIA meetings and see how you can get involved. Volunteer - we desperately need your efforts to reopen this Aquarium. Q.: If I donate and the Aquarium never opens, what happens to my money? A.: We intend to wait out the present city administration and un-shutter the Aquarium within a new, more secure management framework. If the board decides to discontinue the organization we will offer the donors a variety of options that they can vote for online. We will distribute any remaining funds accordingly to other like-minded non-profit organizations. Q.: Why should we keep the Belle Isle Aquarium when the city of Detroit has such a budget shortfall? A.: All cities go through good and bad times. Almost all administrations know that one does not destroy the institutions that make the city a viable place to live. You will notice that the Detroit City Fathers did not close the Aquarium down during the darkest days of the Depression. Furthermore, the national and international negative publicity from closing down the aquarium for financial reasons will be monetarily more damaging than the scant amount it costs to operate. Q.: The Aquarium is old. Isn't it used up? Why don't we just scrap it and open a new one? A.: In Italy you will find the oldest fully functional Anton Dorhn Aquarium, opened in 1873. The aquarium is a source of pride for the City of Naples. 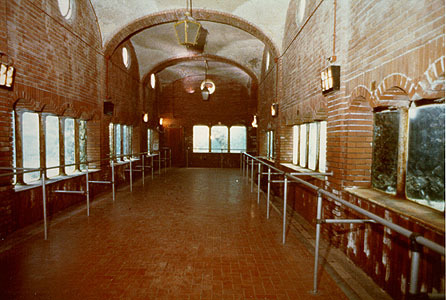 The 101 year old Belle Isle Aquarium is modeled after the Naples aquarium, and is the oldest aquarium in the United States. Q.: Detroit Zoo Director Ron Kagan says that the feasibility study he had commissioned shows that by opening a new, larger aquarium on the Detroit River will bring millions of dollars into Detroit. A.: In 1989 there were 17 'Super-aquariums' in the United States. This figure has since doubled to 36 aquariums. There are twenty more being constructed. You have to consider the law of diminishing returns. Tourists are not likely to be jetting into Detroit exclusively to see the aquarium. Consequently, The burden of maintenance will fall upon the Detroit tax payer, to the tune of $20,000,000 a year. Few Detroit families will be able to afford the $20.00 per person admission fee that will be necessary to keep the aquarium solvent. Did you know that only two aquariums actually break even? The rest have to be subsidized. Kagan's impact study is based on one of the two aquariums that are not subsidized. In contrast, the cost of maintaining the Belle Isle Aquarium is a mere fraction of these larger, newer aquariums and is easily within the budget margins of Detroit's shrinking population and tax-base. Q.: What will happen to the money I donate and the aquarium closes? A.: We will attempt to convince the city administration that the Aquarium is a viable and needed Detroit treasure. It is out intention to secure a lease and discover sources for the Aquarium within a non-profit management framework. If this fails? Presently, it's not entertained as an option, but if it happens we will solicit, then offer the donors a variety of options that they can vote for online. We will distribute any remaining funds accordingly.